Crisp Little Gem leaves tossed with crunchy focaccia croutons, smoked bacon and cheese make a quick and easy main meal salad with bags of texture and flavour. Preheat the oven to 200°C, gas mark 6. Cut the focaccia into rough 2cm cubes. Arrange on a baking tray in a single layer and cook for 8-10 minutes, or until crisp and golden. Allow to cool. Using a pair of scissors, cut the bacon widthways into 2cm strips. Heat a large non-stick frying pan and cook the bacon over a high heat for 4-5 minutes, until crispy and golden brown. Remove from the pan using a slotted spoon and drain on kitchen paper. Seperate the lettuce leaves and rinse under cold running water in a large colander. Whisk together the olive oil, balsamic vinegar and seasoning, and use to dress the lettuce leaves. Divide the dressed leaves between 4 salad bowls or large plates. Using a swivel-style vegetable peeler, shave the Emmental cheese into wafer-thin slices. 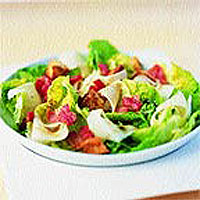 Scatter the cheese, crispy bacon and focaccia croutons over the dressed lettuce leaves and serve immediately.